This tour is dedicated to the lovers of old traditions and legends as well as wildlife. You will discover the history of the famous cities of the Great Silk Road, where architectural masterpieces were erected thanks to the magic of skilled hands. Majolica with juicy paints on high and elegant minarets, domes, madrassas, and mosques still please the eye of every traveler. You will plunge into the atmosphere of the real East, having visited Bukhara, the city of fairy tales and legends, Khiva, an open-air city museum, and Registan Square - the "heart" of ancient Samarkand. In addition, you will taste the oriental food and enjoy aromatic melons and watermelons. 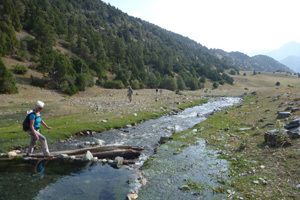 During this tour, you will explore almost all interesting places in Central Asia. Trekking part of the tour will take place in the north-western part of the Pamiro-Alai Mountains, in the area of the Ak-Su peak and the Karavshin valley. This is one of the places with a pristine nature and a complete lack of the benefits of civilization. There's clean air, a stunning night sky, strewn with bright stars, crystal clear water and the singing of wild birds. You will immerse yourself in the local nomadic culture, passing through the mysterious and very little explored mountain chain of Central Asia. The track is also interesting with a meeting with hospitable Kyrgyz shepherds on high mountain summer pastures, where herds of horses, flocks of yaks, sheep, and goats graze. Entering their yurt and drinking hot tea with the milk of yak or mare, you will become more familiar with their culture, which for many centuries has hardly changed. Ulysse Tour invites travelers who are interested in architectural masterpieces of old times and who like active recreation in unexplored places. Transfer to the airport. Departure to Urgench at 19:30 (Arrival at 21:10). Ride to Khiva by a vehicle (Distance – 30 km). Check-in and night stay at the hotel. Breakfast at the hotel. City tour: Ichan Kala Complex, consisting of 60 sites. Time for lunch. Free time to wander around. Time for dinner. Night stay at the hotel. Breakfast at the hotel & Check-out. Ride to Bukhara by a vehicle (Travel time: ~6-7 hours). We will travel through the legendary red desert Kyzyl-Kum, the territory of “Khorezm”, which was called in the past as a “State of Thousand and Hundred Cities”. You will see exotic landscapes of the desert with roaming camels, nomadic yurts, and Amudarya (Oxus) River. Lunch-box meal will be served on the road. Transfer to a hotel & Check-in. Free time to take beautiful pictures of Bukhara on the sunset. Time for dinner. Night stay at the hotel. Breakfast at the hotel & Check-out. Transfer to the railway station. Departure to Samarkand by a bullet train at 8 am (Arrival time – 10:08). Time for lunch. Transfer to the railway station. Departure to Tashkent by a bullet train at 16:00 (Arrival time – 16:55). Transfer to the hotel & Check-in. Night stay in Tashkent. Breakfast at the hotel & Check-out. Transfer to the railway station. Departure to Andijan at 8:05 (Arrival time – 13:35). Transfer to the border "Dustlik" (Distance – 65 km). Passing through the border control. Ulysse Tour representatives will meet you in the territory of Kyrgyzstan. Ride to Osh by a vehicle (Distance – 7 km). Hotel Check-in. Time for dinner. City tour. Time for dinner. Night stay at the hotel. Breakfast at the hotel & Check-out. Ride to Ozgoryush by a vehicle (Distance – 340 km, Duration – 4-5 hours). Tea time with a family of one of the porters while they will be packing camping equipment, food and your personal belongings on donkeys or horses. Trekking along orchards and Lailak River to the wide field, where we will set up a tent camp (1700m). Time for dinner by a bonfire. Night stay in tents. Breakfast in the open air and packing. Trekking along Lailak River and further along Ak Mechet River up to the confluence of the Ak-Suu and Kara-Suu rivers. Setting up our tents on a green glade (2800m above the sea level. Time for dinner by a bonfire. Night stay in tents. Breakfast in the open air and packing. Ascent to Ak-Tyubek Pass (4390 m) and descent to Orto Chashma River valley. Setting up our tents on the bank of Dukonyok River (3000 m). Time for dinner by a bonfire. Night stay in tents. Breakfast in the open air and packing. Trekking through Kosh-Moinak Pass (3260 m) and descent to the valley of the river of the same name. Setting up our tents on the bank of the river (2800 m). Time for dinner by a bonfire. Night stay in tents. the route does not require any special physical preparation. However, participants should not have medical restrictions to active sports. Also, mountain experience is welcomed.